It was a tough opening game, but after holding serve, even Roger Federer didn’t think he would win the next ten games and defeat one of his toughest rivals in just 56 minutes. The sold out crowd at the O2 Arena in London was eagerly anticipating Thursday night’s final Group B round robin match. For the 33-year-old Swiss, because of Kei Nishikori’s three set victory over David Ferrer (substituting in for Milos Raonic, who withdrew earlier in the day), he was already qualified for the semifinal stage of the 2014 Barclays ATP World Tour Finals. For Murray to advance however, he would need to win in straight sets; a three set victory would not be enough. No such scenario would happen this night. The 6-time World Tour Finals champion would race out to a 5-0 lead in 19 minutes, and in a blur, nearly scored a double bagel over the Brit. Murray managed to hold just before that happened, and Federer then served it out comfortably, 6-0 6-1, to finish 3-0 in the round robin stage. He is the winner of his group, and will advance to the semifinals, along with Kei Nishikori. Federer will face the second player to qualify from Group A, while Nishikori will face the winner of the opposing group. Winners of Saturday’s semifinals face off Sunday evening (6pm London/1pm ET/10am PT). 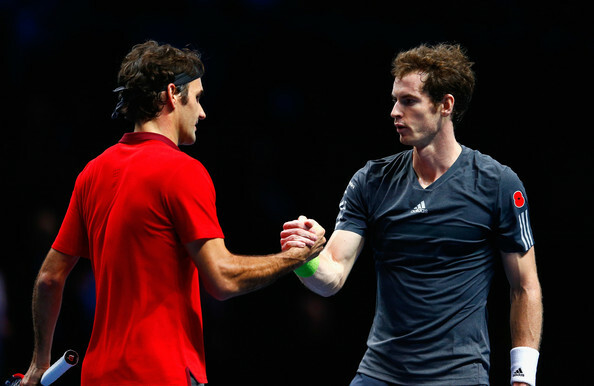 Watch full coverage of the 2014 Barclays ATP World Tour Finals on FedFanTV.